It’s that time of the year again when we all need to take time to de-stress! 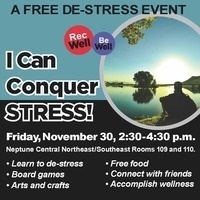 Please join us in Neptune on November 30, from 2:30-4:30 for our event, I Can Conquer Stress! Relax and unwind before finals, play games, paint, color and eat with your friends! We provide mindfulness and stress relief tips as well, so you can accomplish wellness yourself! Hope to see you there!